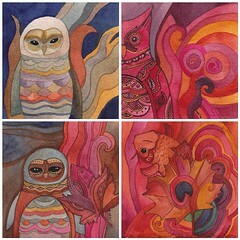 Here are some of the little creatures I have been painting lately. Spent the last couple days with family and am now ready to get back into painting! Jesse and I are going to the Harry Potter exhibit and the Pacific Science Center this afternoon but until then I shall be painting and listening to music! 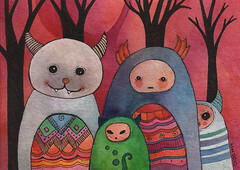 These creatures, and others, are available in my etsy shop. 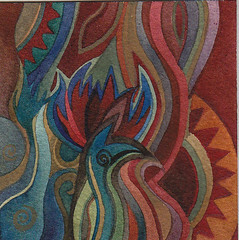 here is another little painting. I am getting kind of enthused about koi. Well, it was birds for a while, so now it may be sea creatures for a bit. And pond creatures. And creatures of the forest and woodlands. I guess I will see where my brush takes me. One of my favorites types of gardens is a Japanese garden and one of my favorite things about Japanese gardens are the koi ponds. I have been fortunately to see the gardens in Seattle, Portland, and San Francisco. And after listening to the audio book of The Tea House Fire by Ellis Avery recently, I am anxious to go to a proper tea ceremony. I can't think why I never have done that, given that I have visited those gardens several times, but I have not. I did have some very nice green tea at the SF gardens, but it was not part of a tea ceremony. Well, it's the 1st snow of the year in the Northwest. As usual panic has ensued. However, in our defense 1) It does not show very often and therefore we do not have a lot of equipment to deal with it, nor a large budget for it. and 2) Seattle has many steep hills. I walk to work so other than being unusually cold and asthmatic, I can get around fine. Though I think I may lay in some tinned milk. One can always live out of ones cupboards but if one is out of milk for tea one will suffer. It will probably only last a few days so I do not that worried, but if it last longer than that the grocery store will run out of things like milk. and 2 years ago - eggnog. It's a shame to run out of eggnog on Christmas Eve! I had to buy silknog. It was better than I thought it would be. Yesterday I spent most of the day wrapped in blankets listening to an audio book and painting. 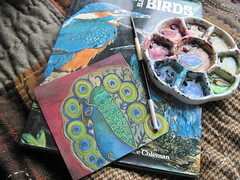 I am really excited about some koi I started painting, but in the meantime here are some more paintings featuring Quinacridone and another painting inspired by peacock feathers. i can not tell you how glad i am to have this last week behind me. it was one of the most stressful and in a long time. 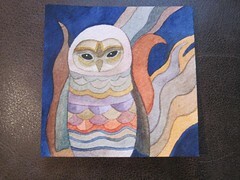 i wanted to share with you this painting i made with my new daniel smith watercolors. Jesse got me the Quinacridone paint set from Daniel Smith for my birthday. 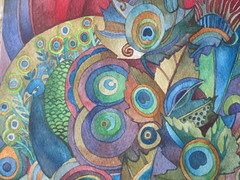 This is one of the paintings I've done since then. 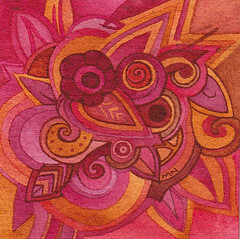 It is 4 x 4". These are beautiful colors! Wikipedia says quinacridone is C20H12N2O2. I do not think I can remember that. I had to look it up. (I had a year of college chemistry, you know I think this is the 1st time I've pulled any of that information into the front of my brain in years. It's good to know I can still understand a molecular formula! i am not sure why the word for hook evolved into a word for crankiness but i bet my late pet hedgehog igle could tell me. he had hooks from hell to breakfast and an attitude to go with them. The painting is on Etsy. After a week off work I am back again! So less painting time. But I hear it is good to leave the house sometimes and interact with people and so forth. I get some time off next week though, so there will be more art time! yesterday was cold and i mostly sat up in bed and painted and knitted while listening to an audio book. that's the nice thing about being living alone, you can paint in bed. while snacking and piling up drifts of books and there's no one to complain about it. 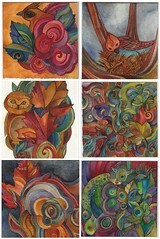 I have some new watercolors on etsy if you are interested! 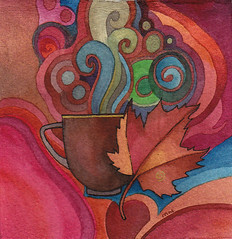 it's a beautiful autumn day - though cold in my condo! 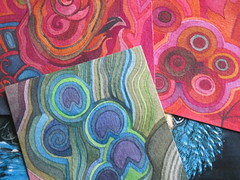 i think i will wrap up in blankets and sit and knit and paint while listening to audio books. 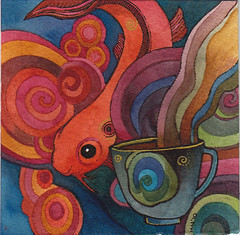 perhaps later i will venture out in search of coffee. this is something i am still working on. well, this painting is done but the idea i am still working on. i am rather pleased so far, though my 2nd attempt which i am not showing you did not come out quite as well. you pretty much have to be willing to create some art you are not happy with to end up with art you ARE happy with so it's all part of the process. anyhow i worked on this mostly while listening to the audio book of donna tartt's The Secret History, which is delightfully creepy but not scary. I have read the book a few times. I am not sure why I like to listen to audio books of books I have read, but I do. I suppose it is sort of cozy and homey like listening to the same fairy tale every night when you are a kid. and. to all veterans today, I salute you. I've not been online much, though. 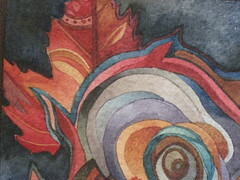 I will have to get my scanner out and scan some of the paintings I've worked on. Seems I am usually so tired when I get home from work that I dink around on the internet more and do other things less. Which is really too bad because I doubt anyone ever gets to the end of their life and looks back saying "I really wish I'd spent more time on Craig's List" or what have you. Today is my 40th birthday and I opted to spend it alone painting, and have no regrets about that. I had a nice day with my mother on Monday and last night my boyfriend and I went out to dinner for our birthdays (his was yesterday) and will likely celebrate some more this weekend. Tomorrow I am spending time with one of my favorite people, my Island friend Kathy. So it's been a good week. happy birthday to my twin sister Marti, I just got off the phone with you but I will say it again! this little drawing was a watercolor. well, i mean it started out as a 5 x 5" watercolor and i was not entirely happy with it so i oomphed up the background a bit with pitt pens. i like the way some of the colors are still a little transparent. they go on pretty evently, though not as evenly i think as prismacolor makers. 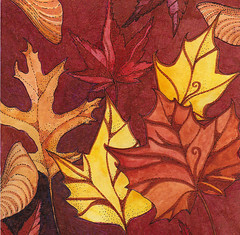 they are quite a bit less expensive, though, and come in all my favorite autumny colors. i actually discovered doing this project that for backgrounds i like the way they look over watercolor better than the way they look alone. and they do go on more evenly on a really thick watercolor paper that absorbs the ink well. the cold of the week has loosened its talons a bit. i am taking next week off and am sort of not-quite-frantically trying to tie up any loose ends today. i'll only be gone a week - what could go wrong? i've had 15 years to get things the way i like them so i can walk away and hopefully no one will notice i am gone. well, they could notice a tiny bit and maybe miss me a little. 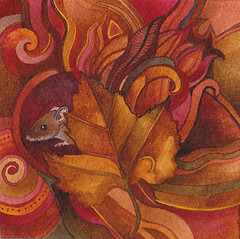 this little mouse is just enjoying the crisp autumn air, smelling like leaves, woodsmoke, and apples. she's going to start building a nest as soon as she's had a little rest. i could use a little nest time myself. i have had a different cold every week for the last 3 or 4 weeks and the current one is not actually my favorite of the lot. but i am taking next week off (assuming all goes well, which i am starting to wonder about) and that may help my immune system reboot or whatever it needs to do. 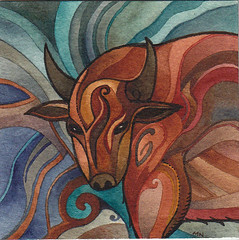 i listed three new paintings on etsy, including this mouse and the bison i posted yesterday. i hope i get some painting time in next week. but they also have something of the sky about them, thundering across the plains like forces of nature. it saddens me that there are so few now, but i am glad to live in a land that is still home to such impressive beasts, and i would love to see one in the wild some day.